40 is the number is Stimulation injections that Matt has given me since March 31. And this morning was my last Stim shot but we are far from over with injections. The picture below best depicts last night, I am over the shots and apparently my body is also. It took Matt 5 stabs for 3 injections…. we always work around the veins in my thighs but last night he stabbed and BOOM blood gushing, so we had to find a new place. Then on injection #3 the needle literally would NOT go into my stomach. Ya, this picture is a dramatic interpretation but I cried, a lot. This morning was my 3rd Ultrasound this week and 3rd round of Blood Work this week, I look like a junkie, my arms are shot. This morning my doctor decided that my follicles (which are in my ovaries and hold the eggs) are mature enough to move forward. I have a good number of follicles and in the past 14 days I have literally gained 7 pounds in ovaries and bloating… I am FULL and uncomfortable. Here are 2 pictures I got to take home of a few of my follicles…. the large circles is what you are looking at and inside those pouches are the eggs. If you ask me I think the pictures looks like Horror mask from the movie Scream.. It made me laugh. Creepy mc Creeperson…. Tonight Matt will give me a HUGE shot called a Trigger which will tell my ovaries it’s GO TIME. And over the next 36 hours I will prep my body for the Egg Retrieval procedure. And below is what is going to happen, so we can all learn a little something together. I will go to an out patient hospital Saturday morning where I will be put under anesthesia for the 30 minute procedure. 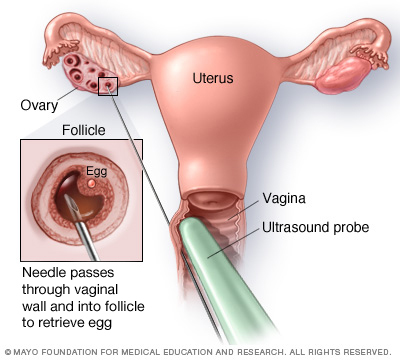 Below you can see that they will use a needle/suction to extract out the eggs. Once it is over I will be in recovery for about 1 1/2 hours and then home to recover for the rest of the weekend. That is the simplest explanation I can give…. What happens after? I will do a post more than likely on Monday to update everyone but over the following 5 days the Embryologist will combine my mature eggs with Matts sperm in the lab and watch them grow to see how many viable embryos we will have to work with. Then next Thursday I will have the embryo transfer. Thank you all for following along with us on this journey and like always it makes me happy when people reach out say they are learning something they didn’t know before. Or that I have helped you to realize what other friends of yours have gone thru… You know me, I am an open book. Just please send your positive thoughts that we will get enough mature eggs to work with and send your calming vibes to me that I can get thru the next week stress free! Next Post The Little Egg That Could! Positive thoughts and prayers coming your way! Can't wait to hear how it all goes! You and Matt will be in my continual thoughts and prayers over the next week! I know His plan for you both is amazing and perfect! So excited! Sending LOTS of positive thoughts and prayers!! When you get nervous or worried today and in the next few….just look back at how far your have come sweet girl! As you said yourself; needles, bloodwork, shots from Matt, along with so much more emotionally the past 18+ months! You & Matt are strong, and your body is proving tough and resilient too.I will be thinking of y'all. Praying for you, for peace and calmness over you and success for this journey.